I was browsing at Costco this weekend (something a sane person would never do on a weekend, when the parking lot is stuffed, the checkout lines are long, and people with strollers are ramming into the back of your legs to get you out of their aisles) and spotted an electric fireplace for sale. The cost was about $500 (and I see there's another model listed on their website for closer to $700), so these are definitely not the entry level models, but they come with handsome mantels and look like lasting pieces of furniture. An electric fireplace can be a handy way to heat up a room and add the ambiance of flames even if you don't have a chimney. They have the same flip-a-switch-to-turn-it-off-and-on convenience of gas fireplaces but cost half the price (actually, it's usually a lot less than half the price). So if you've got a Costco membership and you've been meaning to buy a nice-looking electric fireplace, you might want to stop by fall Their inventory turns over quickly, so go sooner rather than later. You wouldn't happen to have a make & model number on this item, would you? 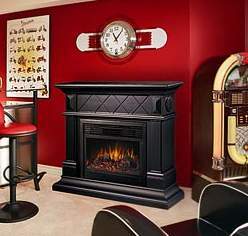 Technology in the electric Fireplaces has gone a long way and they have some beautiful electric units out there now. However an electric can't give that same smell and look of a real fire.